The Papillon is a spaniel that dates as far back as the 16th century. You can even see him in certain Renaissance paintings from this period! A frisky, spirited little dog, the Papillon, a.k.a. the “Continental Toy Spaniel,” is not for the lazy. People like the Papillon temperament for his obedience and agility. Plus, he makes for a strong competitor in dog shows. He is also very bright and has a great personality. He always leaves a lasting impression on everyone he meets. Overall, he is perfect for you if you are looking for a dog who enjoys a lot of activity and fun. You will find that, aswith all dogs, the Papillon temperament can vary on an individual level. This is because a Papillon’s parents are a huge influence onhow he turns out. If you are thinking about gettinga Papillon, you should first research the reputation of the Papillon breeder you’re interested in. You should also ask thebreeder about the temperament of the parents of the dog you areinterested in. Papillons are cute, and they are very affectionate dogs, but if you’re looking for a dog who loves to cuddle, then you’re looking in the wrong place. Papillons simply don’t have the time for cuddles. The Papillon is a dog who doesn’t sit still for very long. He wants to be constantly on the move. This means that he isn’t okay with your keeping him cooped up in the house all day. These dogs need to go outdoors at least once a day to get some exercise. Papillons are good at keeping active. Their ability to run as fast as they do helps them to stalk birds and small animals. You may even see them trying to catch flying insects! Papillons adapt well to kids and cats, so they can make for great companions for active children. They have a sensitivity to touch, though, so you must teach your kids not to overdo it on the petting. Amongst other dogs, the Papillon dog temperament encourages this toy-sized dog to hold his own, sometimes acting rather bossy. Because they are so fast, larger dogs may view Papillons as prey and give chase. The best way to protect your Papillon is to keep him on a leash at all times. Papillons can be shy with strangers, but they are fast learners. It’s never too early to teach your little Papillon how to properly socialize with strangers. These little dogs are so bright that they often invent their own games if given the time and the right toys. Experts were able to trace the Papillon’s origin from the works of art he appeared in. The earliest Papillons popped up in paintings in Italy from the 1500s. Over time, the colors of the Papillon varied in paintings, and his droopy ears in these paintings became more prominent. This is because toward the end of the 19th century, people began seeing the Papillon’s erect ears as fashionable. In fact, the Phalene dog breed is basically a Papillon with droopy ears. While there is much to love about the Papillon, he may come with his fair share of challenges. You can train him to control these bad habits, or you may be able to help him eradicate them entirely. The Papillon’s intelligence helps him learn fairly quickly, but every dog is different. If you find you are unable to help him curb these behaviors, then you may want to consider hiring a professional trainer or enrolling your Papillon in obedience classes. Here are some of the challenges you may encounter with the Papillon. Papillons can suffer from Small Dog Syndrome, which is when small dogs think they are the leader of the pack. When this happens, they may fail to obey commands. They can also become nervous and/or snippy, and they might even growl at you. To avoid this problem, you must always let the dog know that you are in charge of your household’s “pack.” Do this by using strong but gentle commands and rewarding him for good behavior, and he’ll eventually come around. Papillons are average when it comes to shedding, so you may not want to bring home a Papillon if anyone in the house has allergies. Papillons can develop a barking problem, especially when it comes to strangers and new sights or sounds. However, you can overcome this by socializing your dog properly and early. I can also offer you some tips on dealing with excessive barking. Grooming a Papillon can be a struggle, to say the least. For one thing, he has a lot of hair hanging from his ears. This hair tends to tangle, so he has an ever-present need for frequent grooming. If you are not sure how to groom your Papillon properly, or if you find he’s just too restless for you to handle, then you may be better off hiring a professional groomer. Click here for some tips on grooming. You may also want to hire a groomer if you’d like to give your Papillon a shave or cut for the warmer weather. DO NOT attempt to do this yourself, as one wrong cut can leave a permanent impression on the Papillon’s coat. While the Papillon’s small size may mean he’s perfect for apartment living, this doesn’t mean he doesn’t require a lot of exercise. There are a number of tricks you can train your Papillon to keep him challenged, both mentally and physically. In fact, one of his favorite activities is playing fetch inside. He loves being able to find the ball and bring it back to you. As far as the Papillon’s size goes, a healthy Papillon is between 7.9 and 11 inches tall, and between 7.9 and 9.9 lbs. The Papillon’s life expectancy is between 12 and 15 years. Note: Our Health is #1 Priority. It should be no different or your Affenpinscher. But you need to help him. The Ultimate Guide to Dog Health is the answer. This handy guide will help you recognize the symptoms of the health problems above. Get the knowledge to stay ahead of these terrible issues that can rob your lovely Affe from vigor and life. Help your friend make it to 15 yrs+ without pain and suffering. If you’ve decided to add a Papillon puppy to your family, you may not know where to get one. You can find a Papillon for sale from a breeder, or you may be able to find one up for adoption through your local animal shelter. The average Papillon price is between $400 and $2,800. How much a breeder decides to charge for a Papillon dog depends on several factors, including the lineage of his parents and the location of the breeder. If you want to adopt a Papillon puppy, your local animal shelter may have one available. It’s a good idea to check in with several shelters several times, as they always have different dogs coming in who are available for adoption. Adoption is arguably better than buying a dog from a breeder because you may be able to add a member to your family while also helping a dog who needs a home. One thing you should know is that the majority of Papillons available through adoption agencies are adults. However, adopting an adult dog has its fair share of perks. For one thing, older dogs typically know to do their business outside, and their former owners probably trained them to some degree. They also tend to be calmer and have moved past the chewing stage. Talk with the adoption centers and humane societies in your area and let them know that you are interested in adopting a Papillon. Ask if you can leave your name and number on a waiting list for a Papillon. If you are willing to check out similar breeds like the Phalene, be sure to let them know so they can make a note of that. Also let them know if you are open to a Papillon mix. Mixed breeds, or “mutts,” are great because they have personality traits from both breeds, but they tend to be healthier than purebreds. Some people decide to work with a Papillon breeder to purchase a Papillon for sale. If you decide to go this route, you will need to be extra careful to find an ethical breeder and avoid a puppy mill. Irresponsible breeders and puppy mills produce puppies for the sole purpose of making money. They couldn’t care less about their puppies’ health and/or behavior. On the other hand, responsible breeders work hard to create family-friendly, healthy puppies. They do not engage in overbreeding, and they do as much research as you do to make sure each and every one of their pups gets a good home. Good breeders require their buyers to sign a spay/neuter contract to hopefully prevent their puppies from contributing to the ever-growing canine overpopulation problem. It can be both difficult and time-consuming to find an ethical breeder, but it is way worth the extra effort in the end. Never order a Papillon puppy over the internet or buy one from a pet store. It may seem more convenient at the time, but all you’re doing is supporting a puppy mill and encouraging them to continue their bad practices. 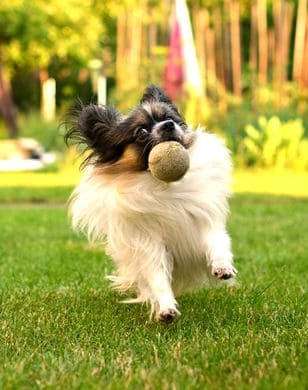 The Papillon dog temperament will certainly keep you on your toes. If you’ve been looking for a dog who will help you get off the couch, then the characteristics of this little guy make for a perfect match. There is one thing you should know before you bring this breed into your home. Unfortunately, because of the Papillon’s size, he is incredibly fragile. So fragile, in fact, that sitting on a Papillon while he is under a blanket or even stepping on his leg can actually kill him. Make sure everyone in your household knows this and can accommodate the Papillon accordingly before you even think of bringing one home. So long as you have the energy to keep up with the Papillon temperament, you will be thrilled to have this little guy around to liven up your home.